Ask the people what they want! 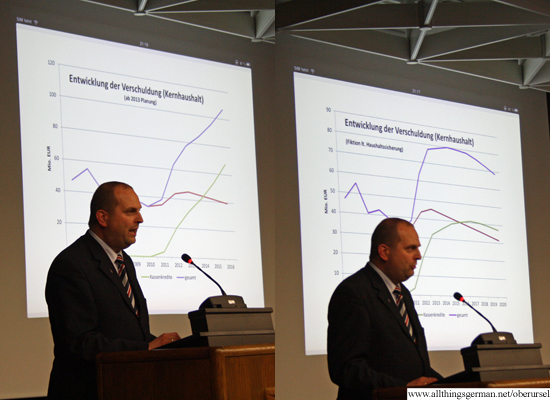 Last month in Oberursel the draft version of the town’s budget for the year 2013 was published, including the details of how it will need to spend more than it earns in taxes and other fees. It is clear that savings need to be made and a “Haushaltssicherungskonzept” needs to be developed. But where can the town raise taxes or cut services without alienating the population? That is probably one of the most difficult questions that a town administration faces, so maybe that is the reason why – for the first time – the town’s residents where invited to a “Bürgerversammlung” at the town hall to discuss precisely that. Around 100 people turned up to take part, and the evening started with an explanation of how the budget is set out by Elvira Schimanski-Sippel from the town’s finance office. The town uses a system called “Doppik” for this – a form of double-entry book-keeping that is supposed to make the budget more transparent. This was followed by the town’s treasurer Thorsten Schorr who presented the facts and the numbers, most of which were explained here in a previous article. In one simple graph he showed what would happen to the town’s debts if the savings did not kick in soon. What was perhaps most important for the following discussion was the fact that there are a number of things that are difficult to reduce the cost of, simply because legislation from higher levels of government require the town to offer those services such as pre-school child-care places. However other services, such as the library and subsidies for public transport are voluntary. In short: apart from any contracts that have been signed the town is under no obligation to provide them and could make an instant saving here. Except, of course, it is not that easy. Closing a library or reducing the U-Bahn services may sound like a simple solution, but it is not exactly good for the town’s image. In the long term it may even cause people and businesses to leave, reducing the amount of tax that the town receives. Besides that, all of the voluntary services added together make up just €6 million of expenditure, meaning that even if they were all done away with for 2013 around half of the deficit would remain. 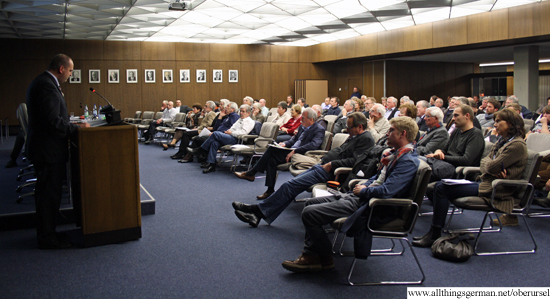 At this point the audience were able to put forward their opinions and questions. Some of which were quite surprising. The first speaker asked why the town is building a new swimming pool if it has not got enough money to finance the other services. At the same time they suggested reducing the personnel costs. In particular they asked what would happen if the land, that is due to be sold off to finance the swimming pool, cannot be sold or for some reason. Another put forward the proposal that the suburbs of the town did not need their own “Ortsbeiräte” (similar to parish councils), that the number of members in the town’s executive could be reduced, and returning to the personnel costs they suggested cancelling any positions that have not yet been filled. One person even asked why the town does not just put up taxes to cover the costs! Whilst many of the questions received answers and explanations, it must have come as a shock to those on the podium that local residents where actually coming to the town hall to suggest raising taxes, reducing services, and removing committees that have been around for the past 40 years. What would have happened if the town’s politicians had suggested that themselves? In the end it was one of the younger members of the audience who suggested simply asking the people of the town what they want and where they are prepared to make savings. Armed with those suggestions things will proceed on Thursday, 8th November at an all-day sitting of the finance committee before the budget goes before the town council on Thursday, 22nd November, at which point we will know just how many of those ideas get taken on board. Good to see r Gouerman cousins have the same issues and deal with them as best they can.